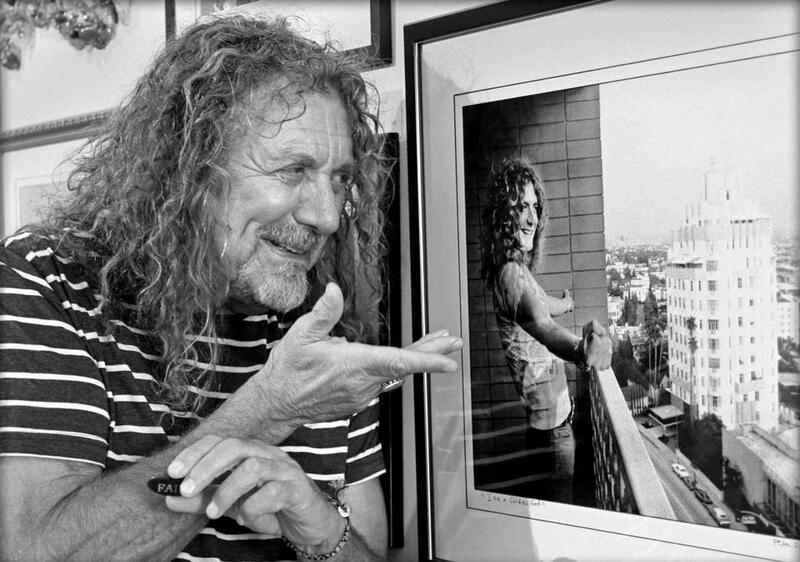 Visiting Peter Simon’s gallery on Martha’s Vineyard, Led Zeppelin singer Robert Plant checks out a picture Simon took of him in 1975. Photographer Peter Simon was plenty surprised the other day when Robert Plant sauntered into his Martha’s Vineyard gallery. The Led Zeppelin singer had been vacationing on the island and saw a copy of Simon’s book “Eye and I” on a coffee table in the house where he was staying. Perusing the collection of photos, Plant came upon one of Simon’s most iconic images: A picture of the Zeppelin singer on the balcony of a West Hollywood hotel in 1975, his fists clenched like a superhero as he admired a billboard on the Sunset Strip advertising Led Zeppelin’s new album, “Physical Graffiti.” (Just as he was taking the picture, Simon has said Plant shouted, “I am a golden god!” which was later immortalized in director Cameron Crowe’s film, “Almost Famous.”) The picture of Plant at the Continental Hyatt House — dubbed the “Riot House” while Zeppelin and their denim-clad entourage were occupying the top floors — remains Simon’s best-selling photo. Plant, who turned 68 last month, lingered in the gallery for a while and then invited Simon to join him for lunch in Edgartown the next day. Plant was spotted on the island several times during his stay, but demurred when passersby asked for his photo.